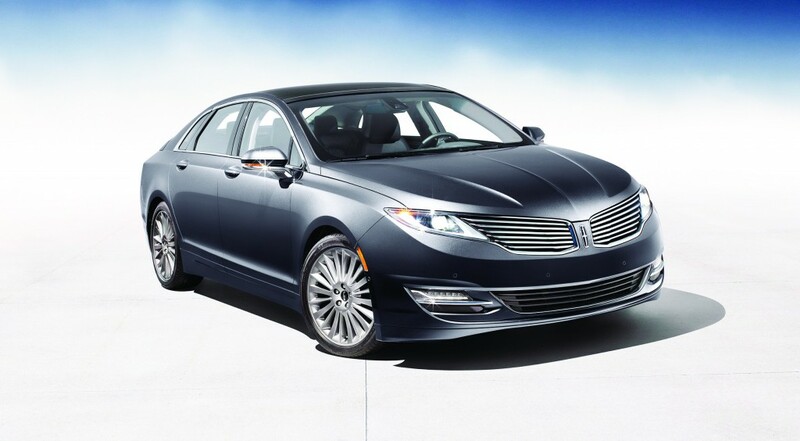 But I don’t get a hint of boredom when I look at this car, the Lincoln MKZ. Perhaps it’s the natural result of years of government cutbacks, austerity measures and class-warfare criticism of the wealthy in some political circles, but many of the MKZ’s competitors have gotten sheepish with their body styling. It’s almost like they’re embarrassed to be luxury cars. This sedan, though, is unabashedly glamorous with its long, swept-back, Hollywood-chic nose, taut rear end and fender lines that wouldn’t seem out of place on a Bentley. The styling is so dramatic, in fact, that you can hardly tell somewhere underneath all that pretty sheetmetal lie the bones of its Ford cousin, the Fusion. The days of badge engineering are evidently over for Ford because I have a hard time seeing much of the Fusion underneath the thick layer of Lincoln varnish on this car. Even though the Fusion is a stunningly beautiful sedan in its own right, often called Aston Martin’s doppelgänger, having a Lincoln version that looks and feels so different is a refreshing choice for buyers. Other than the appearance, one thing that surprises me about the MKZ is just how heavy and solid it feels. Its doors close with the granite “thud” of a high-end luxury car, not the hollowed-out “thunk” of an entry level model. Inside, the cabin is nice but not exactly groundbreaking in this segment. You get all the requisite wood, leather and electronics you expect, but I can’t help but wish the overall cabin styling — especially color choices — were more daring to match the MKZ’s adventurous body. The Lincoln MKZ evokes classic Hollywood glamour with its highly styled body. Its pricing starts slightly over $34,000. One nifty touch is the push-button shifter that eliminates the clunky stick found in most cars, which frees up a bit of room in the cabin. Still, I thought the MKZ’s cabin felt cozy. It doesn’t seem cramped, but it also doesn’t seem as spacious as I expected from the outside. Maybe that’s a function of all the big-car styling cues on this mid-size Lincoln. My test car came with the base engine, a 2.0-liter EcoBoost four-cylinder that makes a healthy 240 horsepower. I like it for the same reasons that Ford’s EcoBoost technology is proving so popular across the spectrum from pickup trucks to compact cars: a nice mix of power and efficiency, with a fuel economy rating up to 33 mpg on the highway in the MKZ. You can also opt for a 300-horsepower V6 that drops the highway economy down to 28 mpg, which isn’t too bad a penalty for the extra 60 horses to play with. The MKZ is also available with all-wheel drive for buyers who want better control in challenging weather conditions. Pricing starts at $34,190, making it nicely competitive among luxury brands, especially for the level of equipment you get. It comes with a lot of standard features that are exclusive to its class, including LED headlamps, a 10.1-inch LCD instrument pod, Active Noise Control and a capless fuel filler. A push-button gear shifter and available panoramic sunroof make the MKZ’s cabin stand out. It uses leather and wood to create an air of traditional Lincoln luxury with a more modern design twist. Still, now that the Fusion is available in sumptuous Titanium trim for $30,600 — and is one of the best looking and driving sedans on the road, in my opinion — I’d be taking a close look at the MKZ’s cousin on the Ford lot for comparison. Finally, one of my favorite things on my test car was the whopping size of its panoramic sunroof. At 15.2 square feet, there was so much glass up there and such a wide opening that this almost felt like a convertible at times, letting me enjoy an open-feeling cockpit while still surrounded in a comfortable, amenity-filled Lincoln cocoon. It’s got a distinctive look and offers a lot of equipment for the money, especially at the base level. Its panoramic sunroof is spectacularly large.